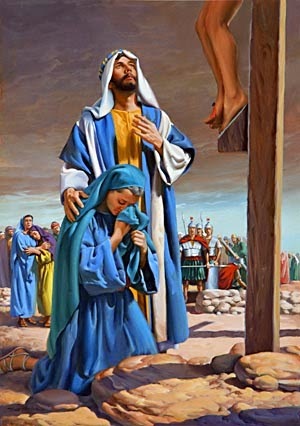 31Since it was the day of Preparation, the Jews did not want the bodies left on the cross during the sabbath, especially because that sabbath was a day of great solemnity. 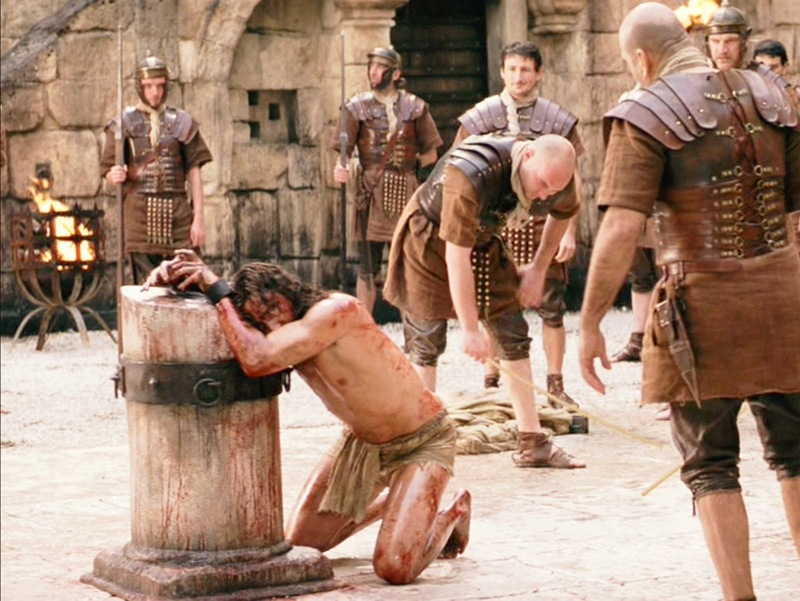 So they asked Pilate to have the legs of the crucified men broken and the bodies removed. 32Then the soldiers came and broke the legs of the first and of the other who had been crucified with him. 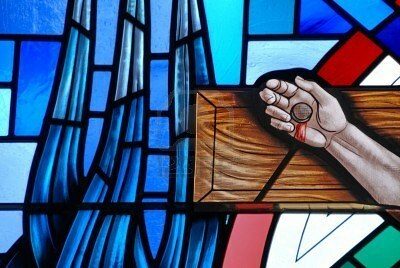 33But when they came to Jesus and saw that he was already dead, they did not break his legs. They must not . . . break any of its bones. 1) As Frederick Buechner states in Beyond Words, “Jesus Christ is what God does, and the cross is where God did it.” What all does God do at the cross? 2) Of all the possible adjectives, why does “Good” precede “Friday” for the day Christ died? 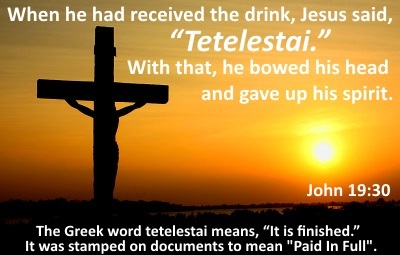 The inscription on Jesus’s Cross was “in Hebrew, in Latin, and in Greek.” These were the three great languages of the ancient world and they stood for three great nations. In the economy of God every nation has something to teach the world, and these three stood for three great contributions to the world and to world history. Greece taught the world beauty of form and of thought; Rome taught the world law and good government; the Hebrews taught the world religion and the worship of the true God. 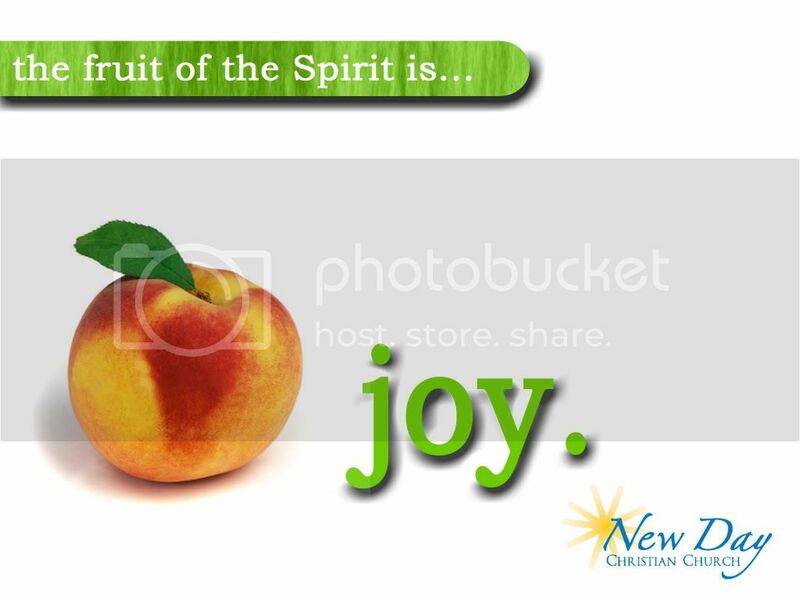 The consummation of all these things is seen in Jesus. In him was the supreme beauty and the highest thought of God. 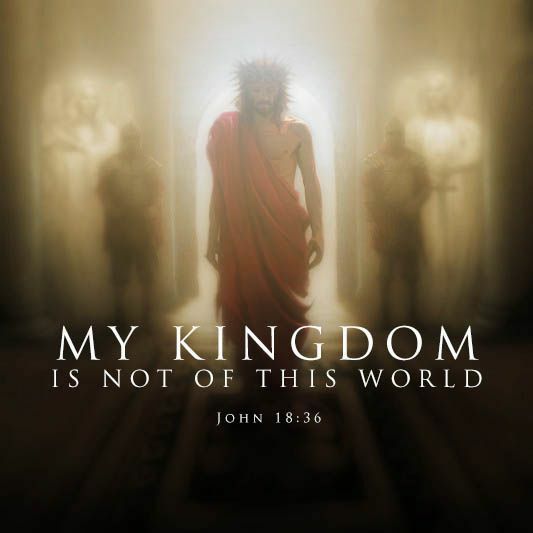 In him was the law of God and the kingdom of God. In him was the very image of God. All the world’s seekings and strivings found their consummation in him. It was symbolic that the three great languages of the world should call him king. 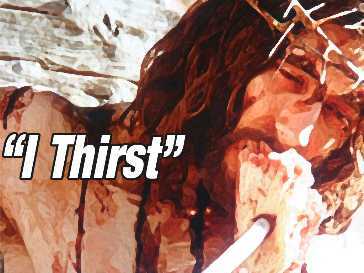 28After this, when Jesus knew that all was now finished, he said (in order to fulfill the scripture), “I am thirsty.” 29A jar full of sour wine was standing there. So they put a sponge full of the wine on a branch of hyssop and held it to his mouth. “When I Survey the Wondrous Cross” — one of the most poignant, moving hymns ever sung. It was written by Isaac Watts and first published in Hymns and Spir­it­u­al Songs in 1707. Charles Wes­ley reportedly said he would give up all his other hymns to have written this one. 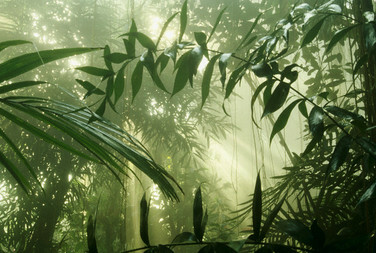 HERE it is sung by Kathryn Scott, with pictures of “the whole realm of nature” by C. E. Price. HERE is a tribute to our Lord Jesus Christ, Lord of the universe, yet willing to go to the cross — “No Other Name,” by Hillsong. 1) Consider Pilate. How would you describe him here? I’ll start you off: he is unwilling (to assume the responsibility of dealing with Jesus); seeking to compromise (will a scourging be enough? ); appealing to the crowd (let them make the decision); superior (hear his demeaning attitude towards the Jews?) . . . You continue! 2) Consider Jesus. Describe him in this exchange. Barclay mentions his “sheer majesty” and “utter directness” in addition to his “physical courage.” How does studying Jesus at this moment add to your own humility and to his glory? 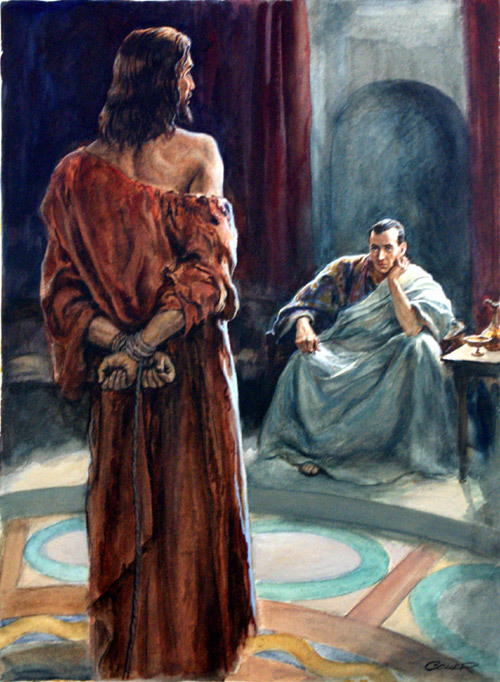 Pilate wants to understand the charges being brought against Jesus. Once Pilate realized it was a religious matter, he dismissed it. Let the Jews take care of their own problems. Pilate is not used to having the accused question him! 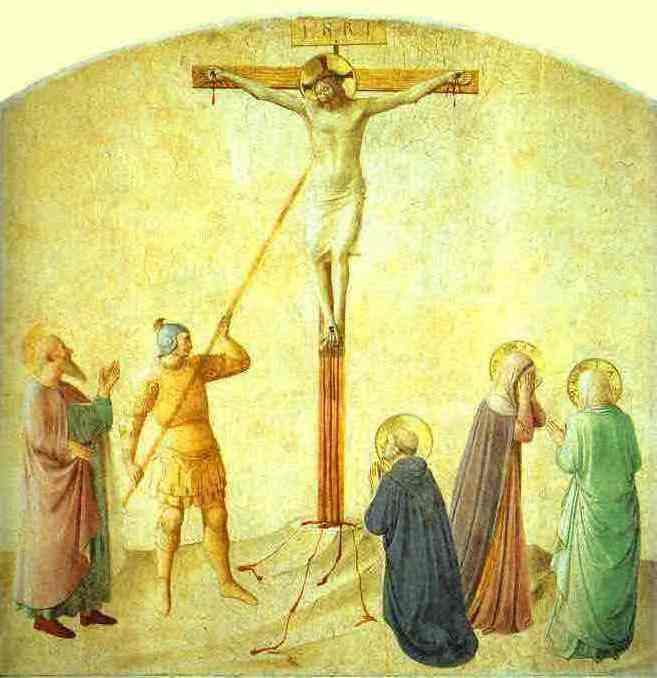 It is often observed that Jesus did not answer Pilate when he asked his famous question, “What is truth?” We may think of the entire passion, however, as Jesus’ answer. The right human relation to the one true God is that of trusting in the life-giving power of the Spirit of the Father, even in the face of hostile enemies. HERE is “There is a Redeemer,” sung by Keith Green. Simple and powerful. So let’s instead remember some of the good of Peter. Remember he alone of the disciples had drawn his sword to defend Jesus when the soldiers arrived. 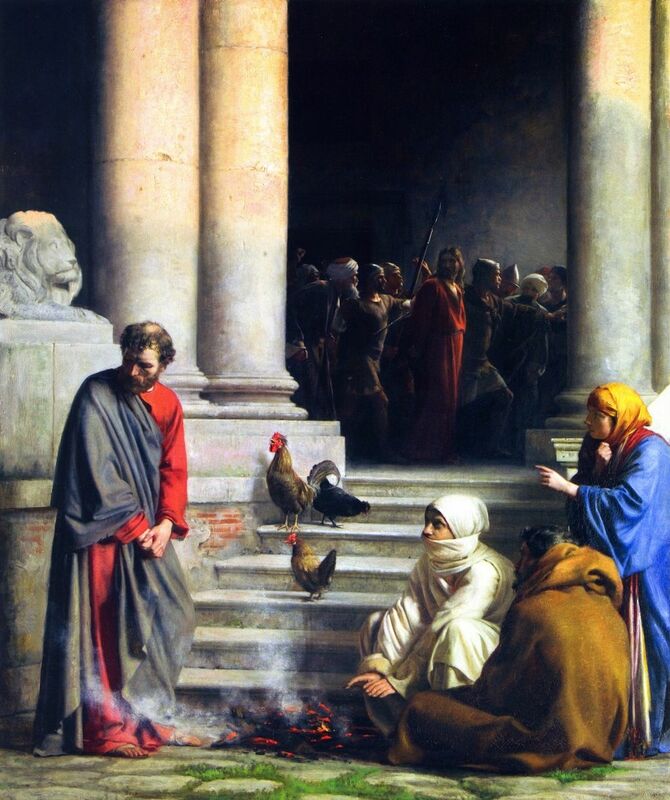 Remember Peter followed Jesus after the arrest, when the remaining disciples scattered. 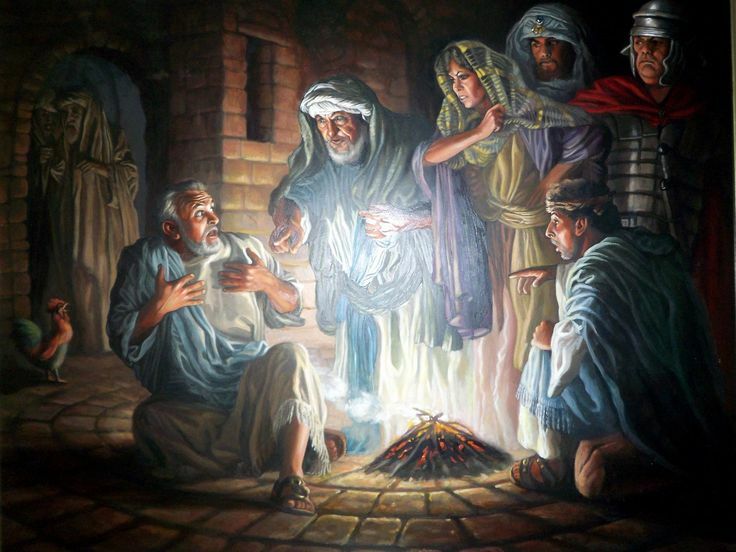 Remember that Peter stayed with the group and was there when Jesus returned to them after the resurrection, whereas Judas removed himself from their company permanently. As William Barclay says, Jesus saw the true faithful disciple under this crack of the denial, and loved him back into fellowship and leadership. Oh, the strong, sweet love of Jesus! 1) Do you see any similarities between yourself and Peter? When the last meal was finished and when Jesus’s talk and prayer with his disciples were ended, he and his friends left the upper room. 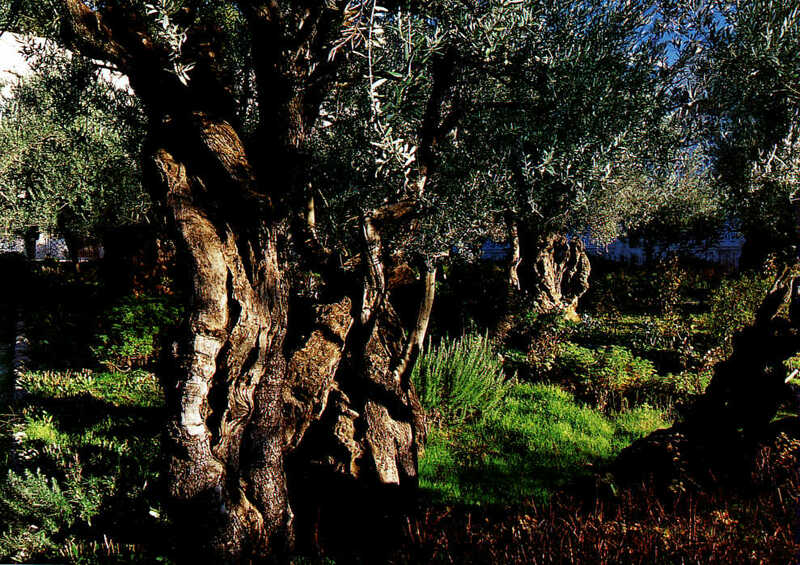 They were bound for the Garden of Gethsemane. They would leave by the gate, go down the steep valley and cross the channel of the brook Kidron. There a symbolic thing must have happened. All the Passover lambs were killed in the Temple, and the blood of the lambs was poured on the altar as an offering to God. The number of lambs slain for the Passover was immense. On one occasion, thirty years later than the time of Jesus, a census was taken and the number was 256,000. We may imagine what the Temple courts were like when the blood of all these lambs was dashed on to the altar. From the altar there was a channel down to the brook Kidron, and through that channel the blood of the Passover lambs drained away. When Jesus crossed the brook Kidron, it would still be red with the blood of the lambs which had been sacrificed; and as he did so, the thought of his own sacrifice would surely be vivid in his mind. See the courage of Jesus: he gives himself up to the authorities. Judas, who betrayed him, was standing with them. 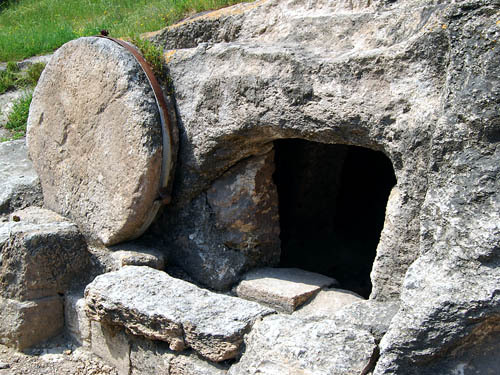 6When Jesus said to them, “I am he,” they stepped back and fell to the ground. See the authority of Jesus: one single, unarmed figure before whom the Roman soldiers and Jewish police retreated and fell to the ground. See the protective love of Jesus: his thought was not to protect himself, but to shield his friends. See the utter obedience of Jesus: if this was God’s will, that was enough for him. 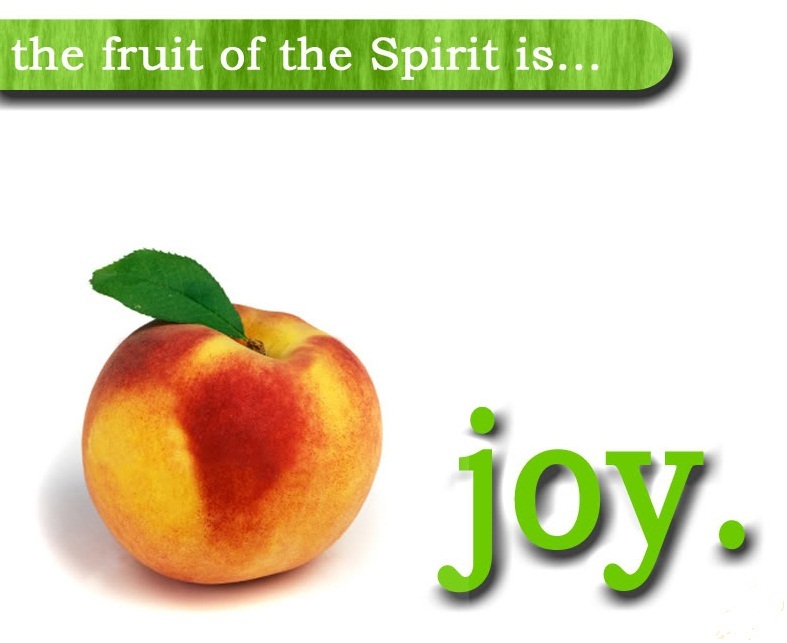 In Eden the sword was drawn (Gen. 3:24); in Gethsemane the sword was sheathed (John 18:11). 12So the soldiers, their officer, and the Jewish police arrested Jesus and bound him. 13First they took him to Annas, who was the father-in-law of Caiaphas, the high priest that year. 14Caiaphas was the one who had advised the Jews that it was better to have one person die for the people. 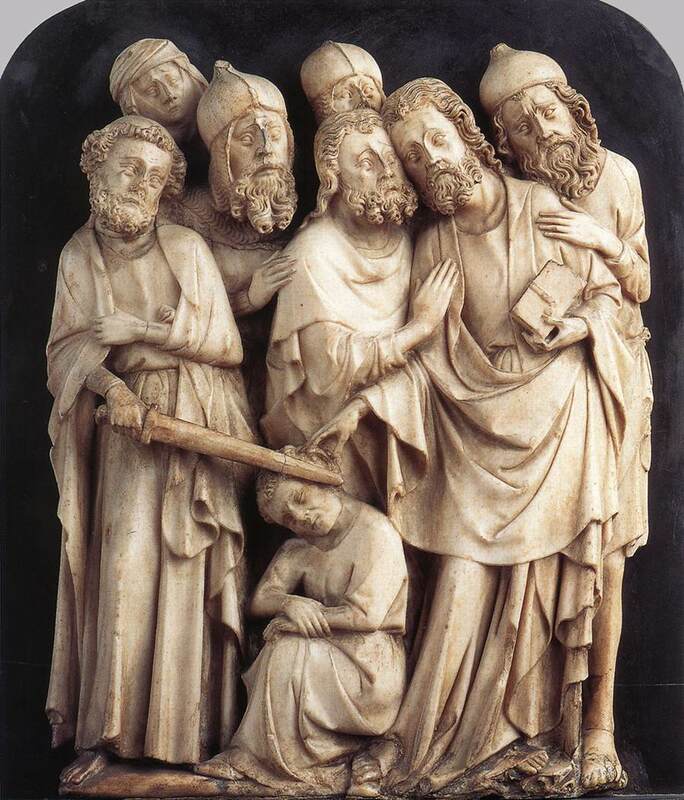 Annas was a former high priest; four of his sons had also been high priest and Caiaphas is his son-in-law. His family was immensely rich and they had, over the years, bought the position of high priest from the Romans, who sold it to the highest bidder and most active collaborator. Jesus is certainly not expecting anything close to justice here. 1) One technique for studying Scripture is to read with your senses alert. I think that method is particularly rich in this passage. Imagine what the garden with its old trees looked like in the moonlight that night, what it smelled like. Can you hear the approach of the soldiers? 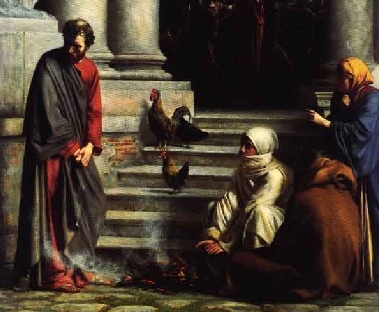 Was there a gasp from the disciples when Judas came in view? Did the tension rise when the ear was sliced off and the blood spurted? What was the look on Jesus’ face as he spoke to Peter? What was the look on Annas’ face when he saw the bound Jesus arrive? How does his house look, and smell? And so on. 2since you have given him authority over all people, to give eternal life to all whom you have given him. 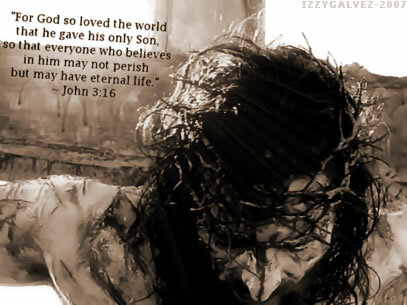 3And this is eternal life, that they may know you, the only true God, and Jesus Christ whom you have sent. We know what God is like because Jesus has revealed him to us. And Jesus has modeled that the way to know God is to be obedient to what he asks of us, by finishing the work that lies in front of us for his sake. 4I glorified you on earth by finishing the work that you gave me to do. 5So now, Father, glorify me in your own presence with the glory that I had in your presence before the world existed. 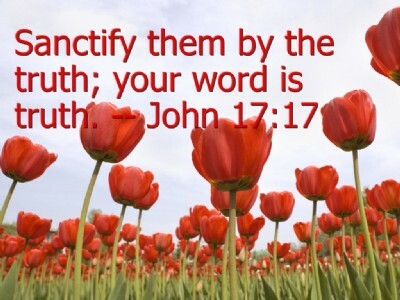 17“Sanctify them in the truth; your word is truth. 18As you have sent me into the world, so I have sent them into the world. 19And for their sakes I sanctify myself, so that they also may be sanctified in truth. From this prayer Jesus was to go straight out to the betrayal, the trial, and the Cross. He was not to speak to his disciples again. 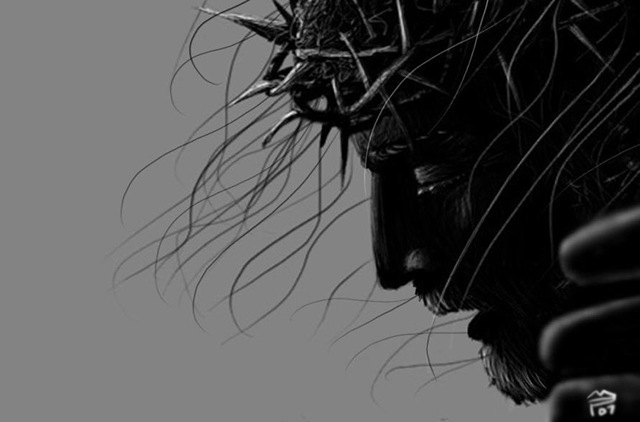 It is a wonderful and a precious thing to remember that before those terrible hours his last words were not of despair but of glory. You are currently browsing the DWELLING in the Word blog archives for February, 2018.